Hello Savour the Senses readers! My name is Katie and I blog over at Oh Shine On where I share my love for good food and a healthy passion for cooking only the best to give your (awesome) body. Work it. I don’t believe cooking and baking should haunt or stress you… it’s meant to be calming, healing, and enjoyable. I am so thrilled to be posting for Jenny today. 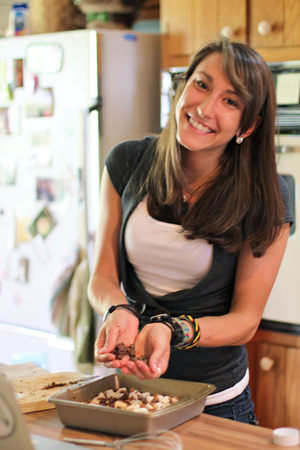 She’s an awesome little lady who also happens to be an all-around phenomenal cook. When she asked me to do a New Years Eve post, I have to admit, I was in cooking torment. I had no idea what I wanted to whip up for this special occasion… that is, until I decided to think about my favorite thing about New Years. No, I’m not talking about the booze and the flashy, ball-dropping fiasco. I decided to go way back to my own childhood memories and the only thing that I could remember from this special night was a special piece of cake… cheesecake. Oh, and perhaps a couple of cookies for good measure. Say hello to my little friend. This recipe makes my eyelashes batter and my cheeks turn rosy with delight. Imagine the perfect combination of gingersnap cookies with cream cheese and sweet sugar baked in the oven. Yes. I went there. I think I’ve entered into a different type of intimacy… you know, not with you, but… with this. Sorry not sorry. I think I’d like to have a bubble bath with this cheesecake… with scented candles lining the tub and classical music playing softly in the background. The finest cheesecake to ever touch your lips… sweet gingersnappy-soft-thick-creamy-cheesecake. Enjoy your New Years with every cookie-filled cheesecake bite. Oh, and it pairs very, very well with wine. Just sayin’. Also noted, this cheesecake is probably a bit more dense than your average cheesecake… but that’s the way my family seemed to enjoy it. I’m sure you could try adding some cool whip into the mixture, but I’m not sure how that would turn out when baked. Interesting, I suppose. To make the crust, grind gingersnap cookies in food processor until coarsely chopped, then transfer to separate bowl. Add oats to the food processor and process until a flour-like powder forms. Add to the bowl with the gingersnaps. Melt yogurt butter and combine with crust mixture. Press mixture into bottom of a prepared pan and set aside. To make the cheesecake, preheat the oven to 350F. Cut out a circle with parchment paper and place in the bottom of a springform pan or baking dish. Coat with non-stick cooking spray. Beat cream cheese and sugar on medium-high speed until smooth (about 2-3 minutes). Gradually add in greek yogurt, egg whites, spices, baking powder, lemon juice, and 1 tablespoon of flour. Mix for 3-5 minutes, or 6-10 if beating by hand (or else the texture won't be as light or fluffy). Place gingersnap cookies into a ziplock bag and crush gently using your fingertips or a rolling pin. Fold into cream mixture. Beat until filly incorporated. Fold cheesecake mixture into the pan coated with the crust and bake for 27-30 minutes, or until the center is almost set. Cool to room temperature and chill a few hours in the refrigerator. Smooth top to level with edges and serve with whipping cream and extra gingersnap cookies for garnish. Thanks so much Katie! What a great New Years recipe! If you or somebody you know would like to be a part of Featured Foodie Friday please e-mail me at savourthesenses (at) gmail (dot) com and we can get you scheduled! Wow, what a delicious recipe. 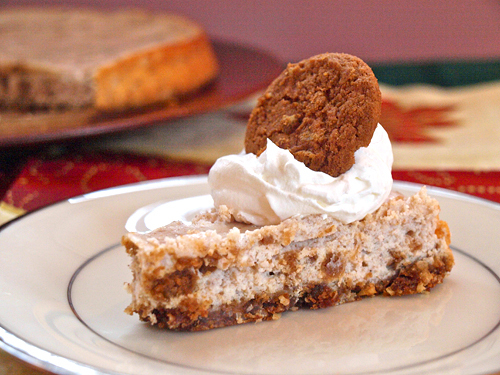 Gingersnap cheesecake! What a combo! Great post, Katie! 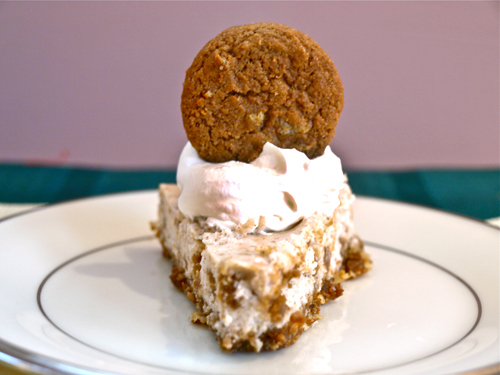 I love cheesecake and gingersnaps sound like a perfect flavor for it. Yum! Happy new year to you both! I LOVE this post and that cake! Wow! I love gingersnaps, but in a cheesecake? I’ll take several slices, please! 😉 Looks really, really delicious! Yum! This looks soo good! That recipe is definitely calling out at me to make it. Great spotlight post, and this cheesecake looks fantastic! Oh wow this looks so dangerously delicious!! Happy New Year! Oh, how fabulous! 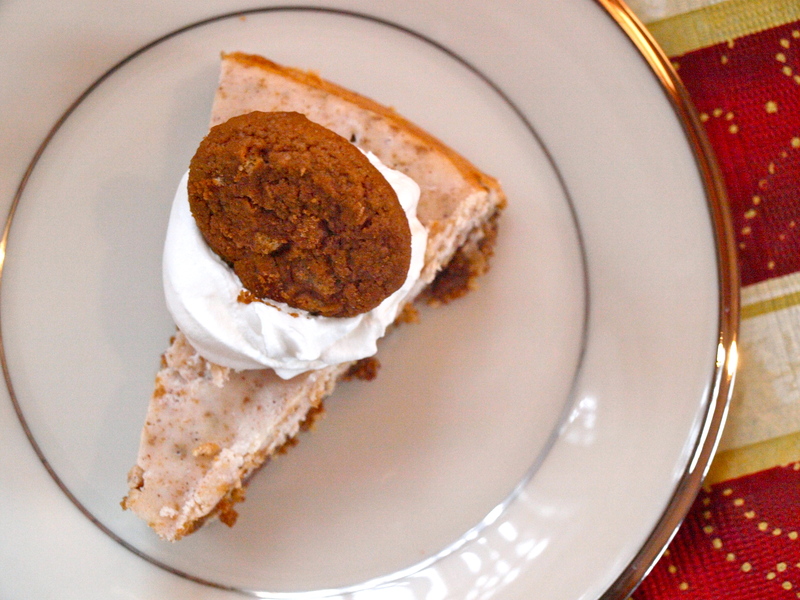 I love gingersnaps AND cheescake, so perfect to have them both in one amazing dish! Exellent guest post…happy new year to you, both! Thank you all for your kind and gracious comments! If you like this post, you’ll love my other recipes — mostly fun, mostly delicious, and mostly healthy! Please stop by ohshineon and follow my blog to receive all those tasty treats that have yet to be posted. Hope you all had wonderful New Years!